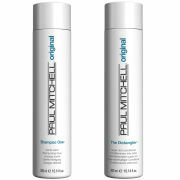 Paul Mitchell Tea Tree Special Shampoo: Fresh and Clean - A special combination of cleansers and Australian tea tree oil leave hair refreshingly clean, while enhancing vitality and adding luster. Stimulates - The combination of tea tree oil and peppermint create a cooling tingle. Invigorates - The unique combination of tea tree oil, peppermint, and lavender creates a refreshing fragrance experience.